We’re a little late celebrating Easter in the pre-K/kindergarten class. I had planned a lesson for the week before spring break, but alas! It snowed that day, and the kids were sent home early!! So I did the lesson today anyway. Easy peasy! The kids caught on quickly, especially since they are really good at counting to 10! 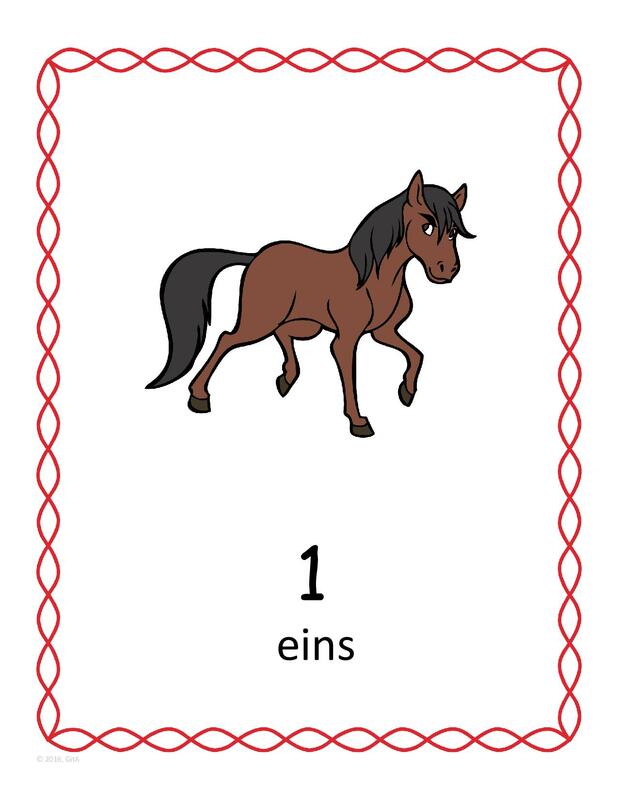 Then we read our book: Eins, zwei, drei, fertig ist das Osterei! 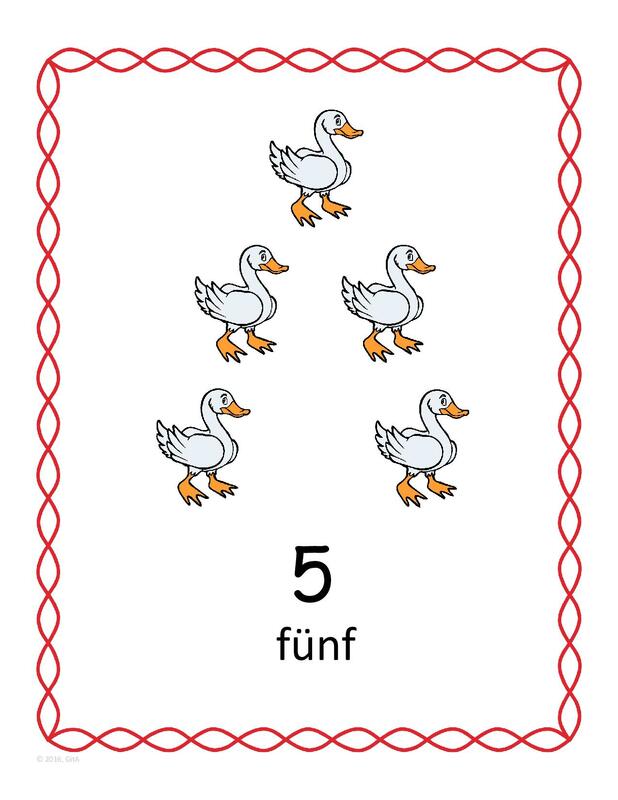 by Ursel Scheffler (Ravensburger, 2008). Pinsel, Farbe, eins zwei drei! On each page, Hasenfranz paints an egg with a different pattern. So we all said the magic words together as I turned the wheel to see the new egg. They loved it! I also brought in some Easter eggs. I had made some stickers for them using round, white labels. They each got two! But before I handed them out, we used them to count to 20. First, we counted all of them to get to 20. Then we counted each color (I had 5 purple, 5 green, and 9 blue – yes, I was one short!). I also gave them a Malen-nach-Zahlen page to color. I updated it from the one I’ve used in the past. Instead of the 6 primary colors, I swapped out two, so I could include rosa and grau. I also made a more difficult version, so the older children could have more of a challenge. I let them choose which one they wanted to color. For three weeks, I’ve been doing numbers in the Pre-K/Kindergarten class. I was wondering if the repetition was good, or if the children needed a little variation! So I came up with a compromise for today’s lesson. We still included number, but we also added some new vocabulary. 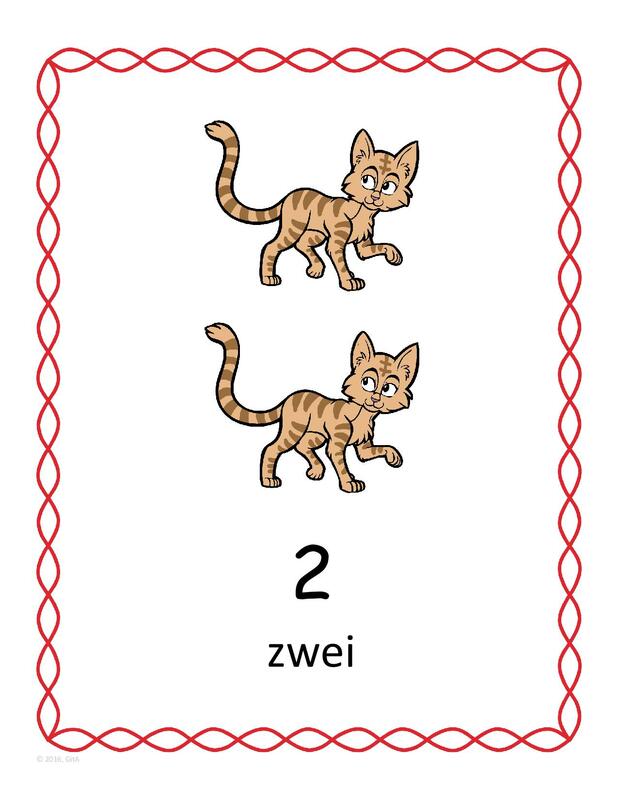 We have been starting each class with our Hallo-Lied and working on ich heiße. As a quick review, we sang “Meine Finger” again. Just like on the first day, we used klatschen and patschen. I added schnipsen this time, too. And to review numbers, we counted to 5 as we did the actions five times each. Then I introduced some verbs. We already talked about schlafen with the song “Unser kleiner Bär im Zoo,” but we repeated that one again here. 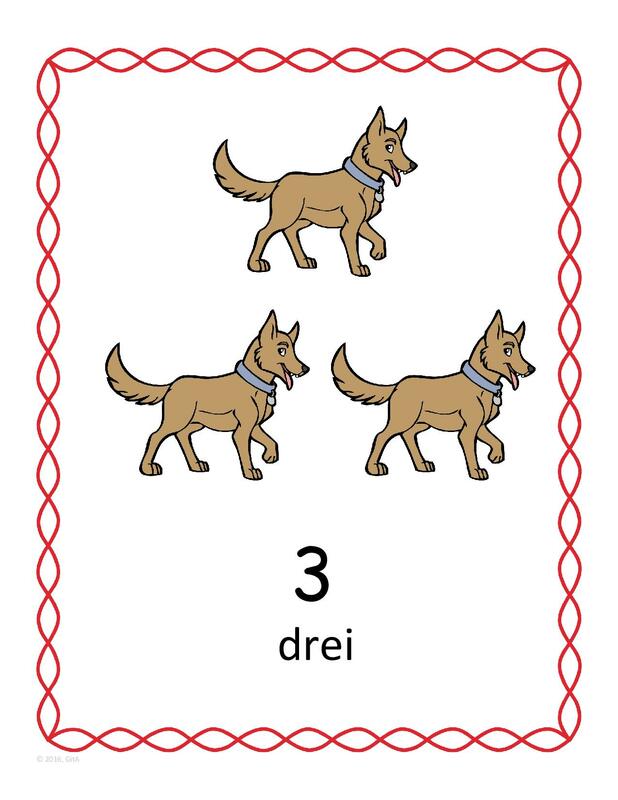 Then we also added gehen, essen, spielen, and steigen (to walk, to eat, to play, to climb). 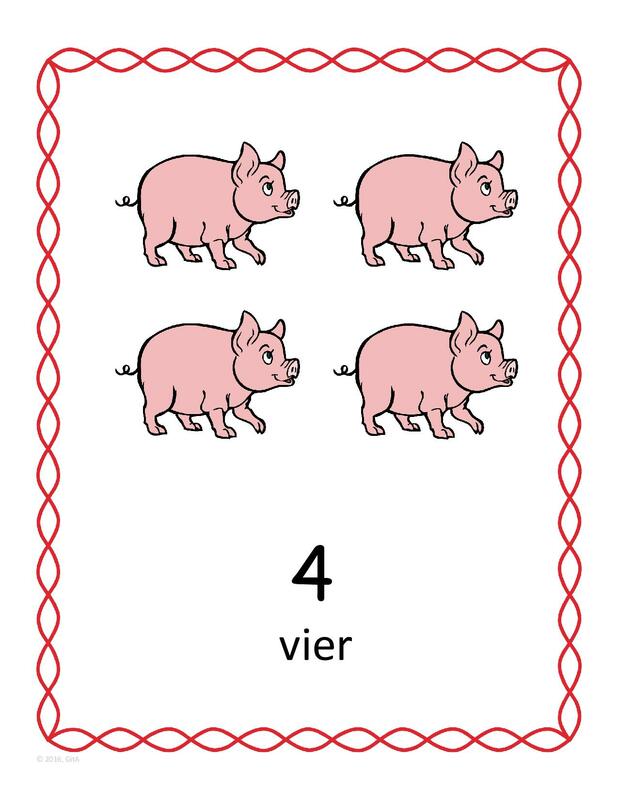 I chose these words because of the book we read: Mein 1-2-3 Mäuschenbuch by Alexandra Dannenmann. In addition to counting from 1 to 10, each page shows a different action. I decided to select just five of the action words to introduce. Usually, I read the book last. But I wanted to end this class with a fingerplay that the children always love! It’s called Die Mausfamilie. You can read the text and download it on this post from last year. In story hour yesterday, we celebrated fall with numbers and colors! The older children only needed a little bit of help. And our younger friends enjoyed making their leaves extra colorful! School’s out! Time for some summer fun! How about some sea life cards to play a small game of memory? Or practice numbers? I also found small objects from a craft store to go along with the six words. I popped them into a busy bag with the cards and made a matching game out of it. Viel Spaß in den Sommerferien! This week in the Pre-K/Kindergarten class, we are focusing on numbers. The children have already been exposed to a few numbers. When we sing the Hello Song, I always say “eins, zwei” when they clap, or pat their legs, or especially when they stomp their feet, so that they don’t get carried away with the actions. It’s also a nice way to reinforce the first two numbers. Then we’ll sing a song from our very first lesson this year. Now that I am going in to teach every week, I really want to bring back the songs and books throughout the year to reinforce the lessons for the children. So we’ll sing “Meine Finger, Meine Finger” from Die 30 Besten Spiel- und Bewegungslieder 3. There is no counting in the song, but we will do the different movements five times and count as we do. I will also do a finger play called Die Mausfamilie. Again, there is no counting, but you use all 5 fingers to represent the family members. I did this finger play in class last year, and the children really enjoyed it. Finally, we will read the book Mein 1-2-3 Mäuschenbuch by Alexandra Dannenmann. This book is available from both Amazon.de and Amazon.com. I’ll send the children home with a coloring page with 5 little mice. With Columbus Day coming up, we were going to miss our first October meeting of Story Hour. So we snuck in an extra session on the last Friday of September. Perfect timing, since fall has just begun! We started out by reviewing numbers. I just grabbed the blocks from the play area to go over numbers 1-10. For the first book (Zehn Blätter fliegen davon), I had put sticky notes on each page to count the leaves that had flown from the tree. That way, the children had the chance to review the numbers again. At the end of the story hour, we did two activities to practice numbers. All of these songs are available to download through Amazon.de!